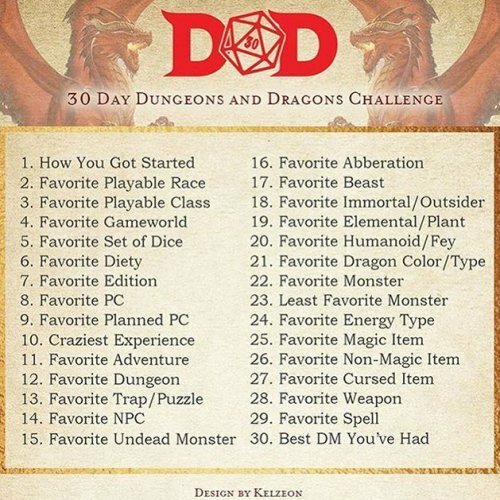 Today’s challenge is to find out what my favourite playable class is. This one truely is tough because I tend to try a different class for each game. In fact, I’m playing an alchemist from the Unearthed Arcana releases in our current game. Of those in the Players Handbook, I tend to keep away from bard and monk. The former due to my distinct lack of performance ability. I’m not really sure why I avoid the latter. Maybe it’s a subconscious thing. The next I don’t play often are paladin and warlock. I find it too easy to get into lawful stupid mode with the former. Again, I don’t really have a reason for not playing a warlock other than I prefer other arcane casters.